A sudden autumn chill sent 2018 Seeing Red Wine Festival attendees clambering for cozy scarves and the warming effects of a luscious Pinot Noir. There were plenty of Cabs, Sirahs, Merlots, and a few Zins and Chardonnays thrown in for good measure, as well. 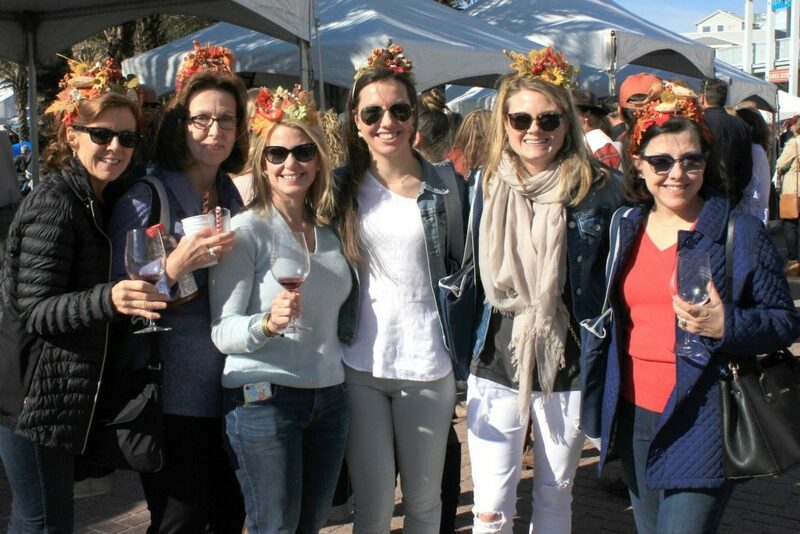 Hailing from as near as WaterColor and as far as Texas, (left to right) Ellen Elsene, Tina Elkevizth, Holly Brennan, Belle Coupland, Susie Bailey, and Janis Mosley sported handmade fall floral headbands. Members of the group were easy to spot in the crowd. 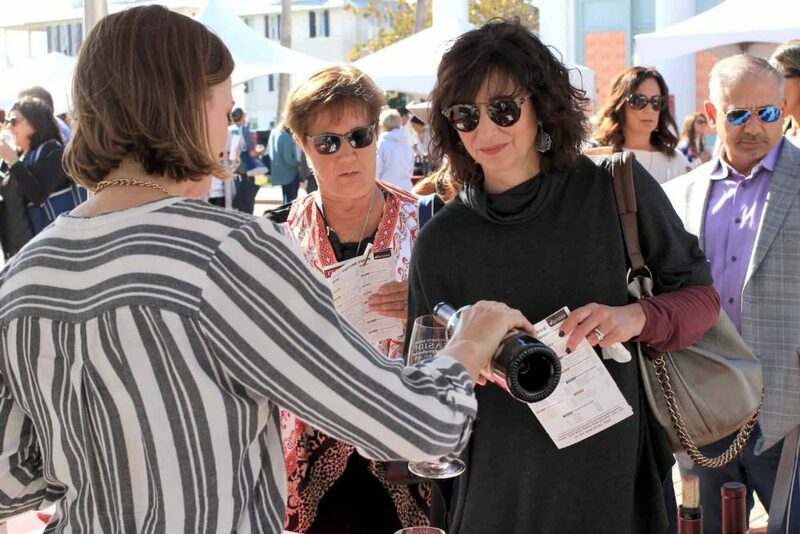 Dressed in their fall finest, wine-tasters had their pick of more than 120 bottles from 29 tents during the Nov. 10 grand tasting, pausing to refuel on the culinary offerings of 16 Seaside food purveyors. Barefoot BBQ, the long-time Seaside Airstream Row tenant, made its debut at the festival, serving up hearty plates of nachos. Five Daughters Bakery – which recently opened a second location in Rosemary Beach – ventured just steps from the Seaside Square Airstream to participate in its second festival. The table was filled with a trio of uniquely textured tempting treats, including the molasses pecan pie, the huckleberry almond with white chocolate and coconut, and the triple chocolate-dipped cone with sea salt. Across the aisle, Richard Park spoke with patrons from the Three Wine Company table. He poured – among others – the 2017 Old Wines Field Blend and the 2015 Napa Valley Chardonnay Stanly Ranch. Coming from the Wagner Family of Wines was the Red Schooner Malbec “Voyage 6,” made from grapes grown in the Andes Mountains. “A lot of zins taste like vanilla and 2x4s, but this one does not,” he said of his 2014 Zinfandel, earning a laugh from the crowd. Shrimp salad sliders were the order of the day from The Shrimp Shack table, featuring steamed Gulf shrimp tossed in homemade remoulade sauce with onion celery, salt, and pepper. “We are here right in Seaside, so we always want to participate in the events like this and be part of the community,” said Shrimp Shack General Manager George Eller, as he sauced up another slider. Seaside newcomers Crepes du Soleil passed out two types of warm crepes, including the poulet (chicken, mushroom, sherried onions and gruyere cheese), and the bananas Foster, with caramelized bananas and Nutella. The sippable frosés – frozen rosé wine blended with honey – were also popular and provided something a little different. Each year the staff at Bud & Alley’s Taco Bar comes up with a special new dish to serve at Seeing Red. Last year they made brisket enchiladas, but for 2018, it was the Mexican lasagna, featuring layers of corn tortilla, chicken, cheese, red bell pepper, white onion and jalapeño, with a spicy sour cream. 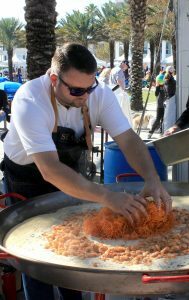 Chef Jim Shirley, a festival sponsor, had both of his Seaside Square restaurants well-represented under the paella tent. After perusing the Porsche sedan on display, one could grab a dish of paella from 45 Central, or Grits à Ya Ya compliments of Great Southern Café. 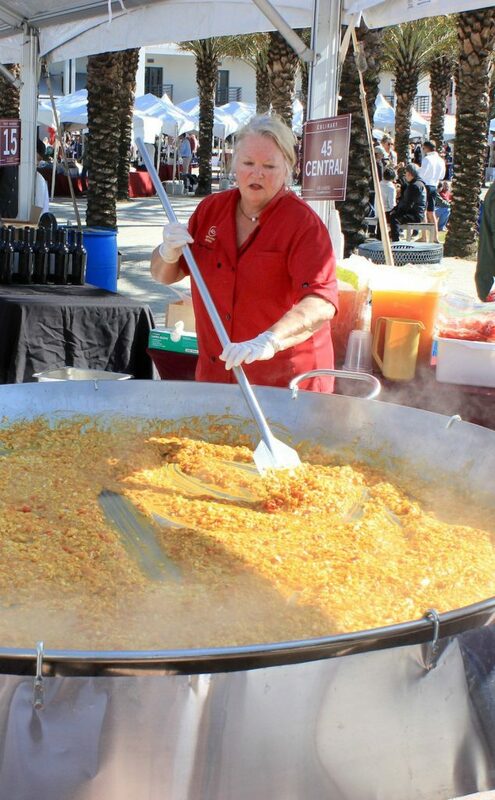 Chef Joyce Russell of 45 Central stirs the massive pot of paella under the tent during the Seeing Red Wine Festival. 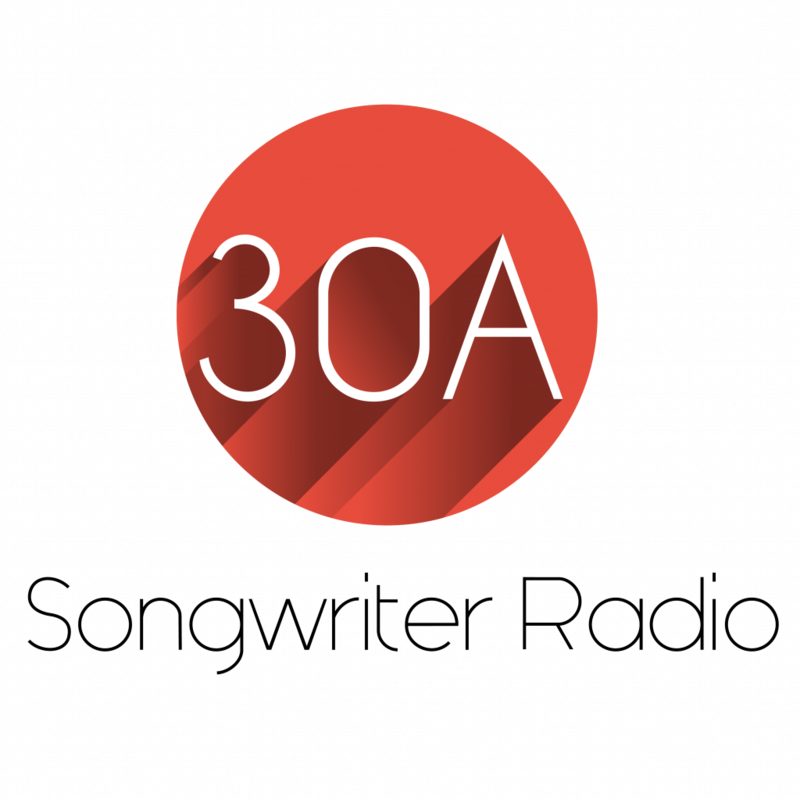 Other culinary partners included Amavida Coffee & Tea, Wild Bill’s Beach Dogs, Pickle’s Burgers & Shakes, Raw & Juicy, Seaside Farmers Market and Olive & Sinclair Chocolate Co. The festival, in its 28th year, spanned four days and also included the Bud & Alley’s Vintner Dinner featuring J. Lohr, a Gulf Coast-to-Table dinner with Chefs Jim Shirley and Zachary Keaton at Ruskin Place, and Sunday’s Celebration of Bubbles Brunch. Photos courtesy of Michelle Farnham. 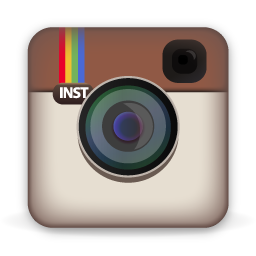 For additional photos from the 2018 Seeing Red Wine Festival, be sure and visit us on Facebook. 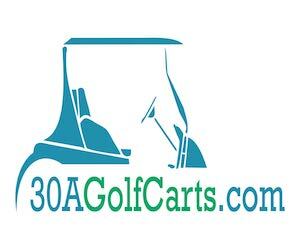 3 for 30a- Happy Birthday Edition!